RGNUL Patiala students have now held a peaceful protest for the fourth night in a row since Friday, after a series of long-standing grievances had remained unaddressed by the administration, coming to a head over the suspension of six students. Police has been present on campus and a riot van filled with police made a temporary appearance outside the campus earlier today, as a large number of students have continued their strike. 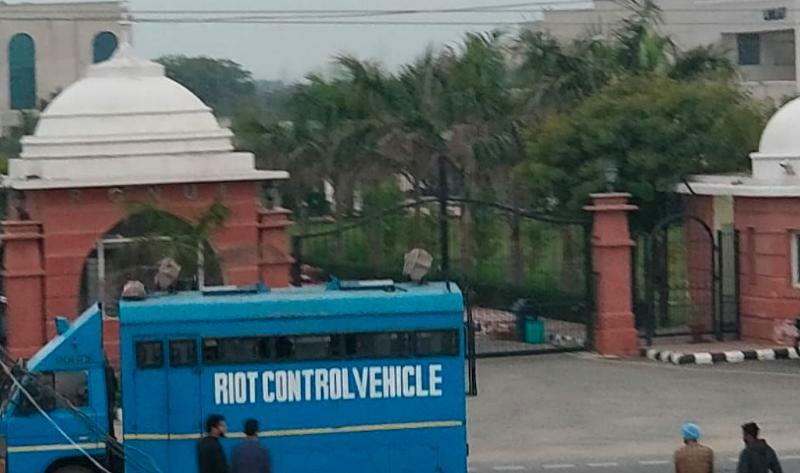 RGNUL vice chancellor (VC) Prof Paramjit Jaswal explained police presence on campus had primarily been there because of “protocol”, during the visits of high court judges to campus, and that he was “not aware of the fact” that riot vans were outside of campus today. “I never called a riot force,” he said. Jaswal added, however, that with 400 odd-students protesting on campus, at one point, he did request police assistance to protect the official VC residence, worried for his wife’s safety who was alone at the time, but ultimately “alumni came and dispersed the students”. Students also boycotted attending the mid-semester exams, which had started today, although some fourth- and fifth-year students sat exams, according to campus sources. Challenging the administration, this Student Association submitted a Representation to the authorities which in addition to the appeal for revocation of the penalty imposed against our six students, highlighted other key issues, viz. lack of transparency, discriminatory in-timings for girls and consociate rampant sexism by the Administrative Officer, and misuse of university resources. The university’s statement primarily concerned the issue around the suspension of students and students’ unwillingness to call off the protests. One student we have spoken to, said that students were in the process of “issuing a categorical denial” of the administration’s version of events, which were “false” (we will update this story with the students’ rebuttal, once we receive it). Update 19 March 2019, 16:13: Students have issued an eight-page response to the administration (with 10 pages of annexures). When we spoke to Jaswal this evening, he said that the suspension of students was only one issue currently aggrieving the students, with a total of four demands that he was currently aware of. Update 22:44: We have included parts of students’ responses and demands to Jaswal’s comments below. The immediate trigger for the protests was the suspension of six students, who had protested against the quality of food in the mess on 13 March by banging steel utensils against tables, with students having allegedly been sick after eating the mess food. On 15 March, those six students were suspended by the administration as an “interim measure subject to the outcome of final inquiry” after a hearing held the previous day, having been “identified after observing the video clips supplied to the committee by certain informers”, according to the administration’s statement. The admin alleged that those students had “banged the plates against the mess tables to the extent of damaging the university property”. The revocation of the suspension of those six students had been the first demand of students. The administration, according to Jaswal and students, has allowed the six suspended students back into hostels for now, pending the inquiry. The suspension was “no more in existence in practical sense”, he told us by phone this evening. The second demand by students in their protest, was calling for the sacking of an “administrative officer” (AO), whom they have accused of “rampant sexism” (with some apparent documentary evidence and student’s oral accounts of his having used offensive language). “But without holding a hearing how can I dismiss? I can’t write that he will be removed after inquiry. That means I have announced the [outcome before the hearing],” he argued. The dining hall protests were just an expression of much longer-running student discontent, which are sadly typical and in some cases identical of complaints of deficiencies at a majority of NLUs. Issues raised and alleged in the document were several, but also included two demands now made by students in their protest. The third demand of students, is that they want an official student representative body. Jaswal told us today that since 1987 student associations had been banned in the state of Punjab. But in the words of the anonymous letter, “as per orders of the Punjab Government, Student bodies are allowed in Punjab from next session i.e 2019-20 in accordance with the approved Lyngdoh Committee recommendations by the Supreme Court”. discriminatory hostel timings, in contravention of UGC Gudelines - “This rule has time and again been violated by the Administration, and is still being violated as Hostel in timings of boys is 1 am, whereas girls’ in timings are 9 pm”, claimed the letter. “And we’ll have to take concern of the parents also. If parents ask me, ‘why did you allow my girl to be outside to 1am’", he would have to have a satisfactory response, explained Jaiswal. While de facto, hostel timings may currently be the same for men and women, Jaswal said that the reason the male students were generally out until 1am was because technically they were breaking hostel curfew of 9pm, which applied to both genders. “sub-standard” faculty and “widespread nepotism in the selection of teachers”, according to a formal complaint that had been filed with the administration in respect of a teacher recruitment round held in June 2017. Academic output at RGNUL, stood at “zero” according to the letter, with only one research centre having utilised any funds. a failure by RGNUL to comply with its obligations under the Right to Information (RTI) Act, in particular with respect to responding satisfactorily to RTI requests seeking information on the allocation of funds. In respect of the RTI obligations and a lack of financial transparency, Jaswal said that he had invited the Comptroller and Auditor General (CAG) to audit the university’s accounts for the past three years, and not a single “financial irregularity” had been pointed out (although some minor procedural irregularities did exist). And while the CAG had initially responded with 18 paragraphs of objection, that was reduced to 5 paragraphs after explanations offered by the university, and eventually to only one objection after further settlement and explanation by the university. Publishing those reports, for instance, could result in “interpretation” that “can be changed evilly”, Jaswal said. When asked why not just publish the full financial statements proactively on the university’s website, in compliance with RTI rules, he said that it “we would also be doing it, no problem”, but that digitisation was currently an issue. 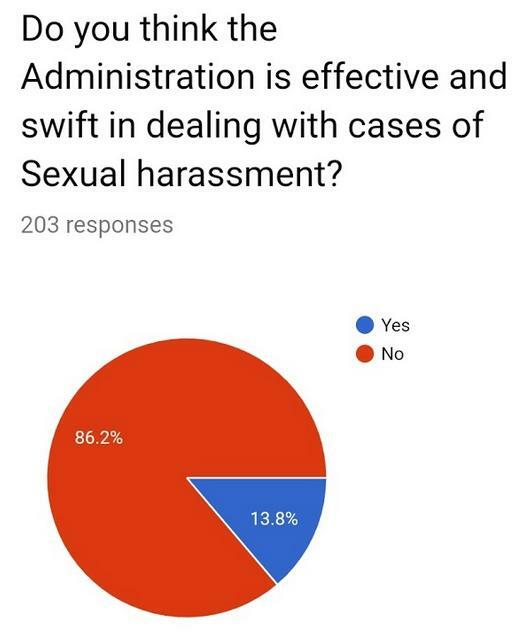 the university’s failure to deal adequately with a sexual harassment complaints, with an apparent informal student survey (the methodology or accuracy of which we could not verify) seeing possibly 86% of 203 students express that the administration was not “effective and swift in dealing” with sexual harassment cases. Evidencing the problem of sexual harassment on campus, one faculty member had alleged harassment by another but filed a writ petition before the local high court early this year. She had complained that RGNUL’s sexual harassment committee did not include a member from an NGO, as required under law. In respect of the faculty’s complaint, he effectively said that the objection was mostly procedural, and that the university fundamentally complied with the law and UGC regulations on sexual harassment committees. The student’s letter also cited some questionable decisions made at the university, such as alleged non-utilisation of “Rs 1 crore worth of student welfare fund”. The Administration in an Executive Council meeting of 2018, passed a rule according to which, the leftover funds allotted in an event would go to the teachers involved in the event, and not in the University coffers. (If Rs. 1,00,000 have been earmarked for an event and Rs. 60,000 are utilized, Rs.40,000 will be distributed among the teachers). Jaswal explained that this was a misunderstanding of the rule, and said that event organising teachers would only be entitled to 40% of the leftover event funds “where university will not contribute a single paisa”, and all the funds were procured from external sources. The idea was to incentivise teachers to organise and fundraise for events. And of those leftover funds, 60% would in any case go to the university. Furthermore, the document alleged that the legal aid clinic was all but inactive and healthcare services provided to students were deficient. Finally, and perhaps most crucially, the document bemoaned a problem that quite a few NLUs with opaque administrations face: RGNUL does not allow students to have a student body. If it did, perhaps things may not have got to the stage that they have reached now. Stalemate or a way out? The situation on campus appears to be at a bit of a stalemate now. As protests in other NLUs have evinced, the student fraternity needs to stand united in support of movements against dictatorial administration. NLUs, and many other educational institutions are plagued by similar problems, and it is imperative that in this struggle against injustice in places where justice dispensation is taught, students stand in solidarity with the protestors, for this is fight against a system which has been constructed against us. We beg not for charity, but demand our legal rights. To that extent, we hope that you stand in solidarity with us. The students of RGNUL have been out on the campus streets hungry, tired, and sleep deprived and the support of our fellows means the world to us. Support us, for we stand for principles which are espoused in our Constitution. Support us because this is a long struggle. But mostly, support us so that we can finally rid our educational institutions of maladministration and focus on the motive for our presence in them – quality education. From our conversation with Jaswal this evening, at least, he appears willing to talk to the students and is ready to meet demands. Note 21:34: This story was updated with comments from vice chancellor Prof Paramjit Jaswal, after initial publication. Update 23:18: We have spoken to several students and included their responses to some of Jaswal’s points. In a nutshell, students’ primary objection is that they do not want to call off the protests until the administration has agreed at least to some of their demands in writing, on RGNUL’s official letterhead. 1. The hostel in-timings should be 1 am for all students in force from today. 2. Constitution of committee for inquiry into the complaints & grievances against the Administrative Officer. a) In Verbatim Minutes of the meeting to be made public. b) Constitution of Committee without conflict of interest. 3. Definitive assurance of Constitution of democratically elected student body. 4. Unconditional revocation of suspension of six students. Regarding to fourth point, many students feel that the suspension of the six students over the mess-hall incident was unfair, since up to 200 other students were also banging plates in the mess hall, and one of the six students was basically suspended for recording the protest on their camera phone. “It is now day five of the protests, but all is peaceful,” said one student at the end of our conversation, sighing deeply, settling in for another long night. One thing is clear: as much as the administration, students too would like this episode to conclude so they can sleep on a soft bed. But students are also not ready to concede, having finally won the ear of the administration, with some expressing doubts whether the university would actually keep promises and accede to students without backtracking, sweeping things under the carpet or future reprisals from faculty. Tomorrow, the state advocate general has promised to visit the protesting students on campus and to mediate. But one thing that may need to be fixed more urgently than simply a series of demands, is for the administration and faculty to rebuild the trust of students that they have lost. I really bow in front of the students of RGNUL Patiala as I am not following their protest ONLY but their totally non violent and just method of protest. It is really shameful that authorities are so tyrannical and authoritative to a bunch of peaceful protesters. That is the reason that we are not able to produce so many gems out of nationally recognized institutions as they crush the voices of reason and logic from within and fail to provide open and fulfilling enviornment for talent to grow. How can one expect an Institution to garner its rightful place if there is open nepotism in the selection of teaching faculty and some of the faculty practices sexism with impunity. All NLUs must hold a joint class boycott together, at least for 1 day. Only then will the CJI and central government take note. NLU after NLU has protested, but these people have not taken note because it's scattered and fizzles out after a few days. Also, the coverage is stronger in the local media of the concerned NLU. On the other hand, is 20 NLUs marching together just before election time, especially NLSIU, will attract instant attention and make it to NDTV, IBN etc. The Kanhaiya and Sheela part is patently untrue. If anything, the world outside RGNUL supports you fully. yes we do need a #joint effort. Let the green revolution begin. Dear students, please call off the protest. You have made your point. The main demand has been met and VC Sir has said he will look into others. You will only spoil the reputation of the college and placements. You know that VC Sir right now is the most senior and respected after Prof Ranbir Singh. Please do not do all this. Outside people are comparing students of RGNUL with Kanhaiya and Sheela, which is very bad and not true because you are excellent and brilliant. You use this tactics to discourage the students who are protesting since 4 days for now. VC have failed the students. we have lost faith in VC because he has not taken single decision in favour of students instead he is never on campus to adress the students. Infact the timetable of certain class mentions that some classes will taken by VC but the fact is he is not on the campus for the same. Learn from other VCs who is so generous about the students. He is roaming around the world (Precisely Italy) with A registrar (his term was extended by one year as he was to retire in 2017) for betterment of academics in university but what have we got nothing only a incompetent administration. I am sorry to say but you seem like someone who has still not been able to get to the depth of this issue. I won't discuss everything here as it is too short a platform. But there have been protests before even when I wasn't in this college and currently I am studying in my fourth year. So you can imagine the plight of students here. You can also speak to any of the alumnus. They would enlighten you further. So many issues at RGNUL as alleged by the protesting students and yet none of them were raised (in an organised protest to the present scale) before the mess food made them sick? It seems like the truth will ultimately lie somewhere in the middle of the two truths being supplied by the students and the administration. 1. The parents of daughters have to agree to equality in timing of coming late in the nights while a great majority of parents want their daughters to come "home' early in the night only because of their security in an unsafe north India. 2. If their is an issue of quality of food, the NLUs can allow cooperative mess managed by them. 3. Why the faculty keep silence when students stage protests on campus? More than the Vice Chancellor, they can make better contributions in resolving issues raised in the protests. Bhai English seekh le pehle - uske baad borna kuch. I have a feeling that VC seems to be really active in this comments section. Will be great if you can just peek out from your residence. We are dying in cold. 1. If students are adults, why should parents' opinions have any bearing on the timings of students? The less said about the VC, better it is. He is too focussed on infra. Seemingly wanting to build a charbagh style in the university. Will someone tell him that it is a university - and not a historical/tourist place? Those funds can be utilised better. And, I don't even know how much has been spent on VC residence. Will someone count the number of ACs in his official residence? Sheer wastage of funds. Absolute wastage. Why is no one talking about that? The comments are very unfair. Prof Jaswal is an experienced administrator and scholar with PhD from London university. He may be next VC of NLUD. On the one hand you are saying you want good faculties then this is your treatment of such a learned senior faculty? Also, kindly note that every NLU is having faculty issue. RGNUL is a better situation that most of them. Some people are making demands for alumnis as faculty. It is not so simple. Phd from London university? Was that a troll on the current state of affairs? 1. The University regularly penalizes students without affording a proper hearing. 3. The University conducts 'raids' at odd hours of the night, waking students up, and blanket searches all the rooms in the hostels attempting to find contraband. 4. The University then uses the contraband to silence the students' claim rather than do something about it. 6. The AO is a MCP, who once addressed girls on how he could see their bras under the shirt and that was problematic for him. 8. As an academician, the VC is below average at best. 9. When some student made videos of the hostel contractor using spoiled vegetables in the food, the University banned Facebook to stop the circulation of the video rather than addressing the problem. Heartwarming to see the plethora of budding Gandhijis and Netajis in Indian NLUs. Dont like Mess Food, No problem bhai, protest against tyrannical admin. Dont like exam result? Its the big bad VC. Dont like suspension (who does)? Destroy college property. Dont like a particular teacher? Accuse him of sexism and demand resignation. Indian NLUs are in self-destruct mode at the moment, except the smarter ones like NLS and NALSAR. The insiders in the NLUs located in the North Indian states from Punjab to Bihar (including UP, MP, Chhattisgarh, Jharkhand) are bent upon destroying their own institutions. The students want: no hostel timings for girls, no raids on hostels for searching alcohol bottles, no detention-policy on the ground of attendance shortages, umpteen number of repeat chances, opening library 24 hours etc. If these demands are not met, first of all, that too all of sudden, they will protest against the bad quality of food. Poor excuse. The students bring pressure on some faculty members to join them silently and secretly. Some teachers cave in (or some are tempted to provoke other fellows)... and they know that otherwise they may also be targeted. It is a vicious circle operating in Northern NLUs in Hindi belt. They can never compete with NLSIU, NALSAR, NUJS etc. If Prof. Jaswal is a 'scholar', then I am Shah Rukh Khan! Come on! This guy is a known tyrant. His thoughts belong to the 18th century. Leading people in the legal industry have been turned off by his arrogance and egotism. HE has been at the helm of RGNUL for the last 10 years and is the reason why the institution has failed. I applaud Legally India for giving balanced coverage to this issue and giving fair coverage to the views of the Hon'ble VC. Websites like Bar & Bench and especially Lawctopus are doing totally one-sided propaganda. [...] The reason is that RGNUL is not a law school that will pay lakhs of rupees to people for advertisement. Hitting below the belt..... Not a good thing... Why to bring in HPNLU in this debate. Just unethical. Students are alleging that AO used language like MC and BC. Shocking! It's unbelievable that someone could make such statements, especially which could be documented electronically. Koi usse gender equality ka chashma pehnao. Andhapan bahut hua. Disability acchi cheez nahi hai. Typed and printed on paper is not the same as documented electronically. Freedom of speech and protest is a good thing, but to misuse it is a very bad thing. The only NLUs to have never had a protest are NLSIU, NLUD, NLUJ and GNLU. This means they are either really wonderful places, or so autocratic that students are afraid to even go on strike. Surprising that LI, B&B and Livelaw have not reported the GNLU registrar sacking. Only TOI has done it. Is it true? There is no protest happening at GNLU. Fake news.